What if you loved your home again? You can. Just like Tanya did. She contacted me about a year ago because she was drowning in clutter and chaos. She was crazy busy with work and kids and commitments but her home was not providing her the rest and comfort and support she needed. In fact, it was adding to her stress. She felt like all she did when she was home was clean, pick up after everyone, do laundry, and clean some more. She even tried to declutter for a whole six months prior to calling me, but she said she felt like "stuff kept bleeding out from her walls." So we worked together to put a plan in place to take manageable steps each month to declutter and simplify her home. I gave her instructions and homework and kept her accountable. I also gave her personal help when she felt like she was at a roadblock. It changed her life. Tanya now says she feels light, free and in control of her house again. Even though she's still busy with work and kids, she feels like she can handle it all with grace. Her home is now supportive of her and her family, and it's making a difference in how they interact with each other. She's less tired and has more energy. She has more 'fun time' with her family. She has more time for self-care. She has more time to be productive toward her goals. And she's in a much better mood. In turn, her husband and kids are in a better mood as well. That's how much our environments affect how happy, healthy and productive we are - or aren't. Clutter, distractions and disorganization at home blocks energy from flowing to us and prevents us from living at our best. 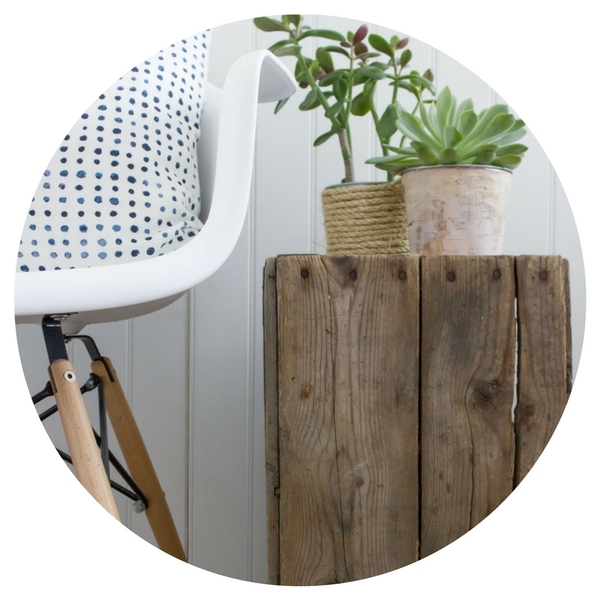 When you have an essentialist home, it Takes the OVERWHELM away & helps you thrive. What Tanya created was an essentialist home. She didn't want to be a minimalist, but she did want to simplify her space and gain back control. And that's exactly where essentialism can help. Essentialism for your home is not about having only a certain number of things in your home or creating a capsule wardrobe. It's about filling your home with the things that will help you focus on and achieve your goals and your dreams, and eliminating those that don't. It's about intentionally designing a home that supports you and helps you thrive. The Essentialist Home program will help you transform your home into a calm, functional and organized oasis from the storm. It's a 12- month online and email coaching program that walks you through decluttering and simplifying your home from top-bottom and putting systems in place to maintain that simplicity. This program sounds big - and it is. It will get you huge results. It’s a lifestyle change that you’ll keep forever - not a quick fix declutter that lands you back in the same situation a month later. But in reality it won't disrupt your life much at all. It's spaced out over a year so that you can keep up with the tasks without disrupting your normal schedule. The program gives you step-by-step monthly instructions on exactly how to tackle the chaos in each area of your house once and for all. Small steps = big results. This is not a course you purchase, look at a couple of times and then forget about. This is a PROGRAM. It's coaching and community and accountability. Having a coach by your side makes all the difference. I provide motivation + inspiration + gentle pushing to get you real results. I'll be with you all year long to help you work through emotional issues and change your life by changing your home. 12 months of email coaching plus written course lessons on the program website. Each lesson within the month has a clear action step and focuses on a different area of your home. The lessons guide you through a particular order of simplifying so that you'll get bigger results as you go. The emails from me will be to point you to your lessons, add extra inspiration and check up on your homework. Q&A coaching sessions with me on our private Facebook group and answers to your questions about problem areas in your home. You’ll have direct access to me over email as well; I’ll be here to support you throughout the entire year. You'll also have the support of a community of other course participants going through the same process as you. It's amazing motivation, and you'll always have that community to hang out with online. A slow and steady laid-out-for-you process for decluttering every inch of your home. But the program goes beyond decluttering to help you implement home hacks that will simplify your days, make cleaning and maintaining your home easier, and build new good habits. This is the mother of all declutter and simplifying programs, and you'll feel the benefits of gaining back more free time and peace of mind! Free resources including a home checklist, organizing labels, DIY instructions, free tools and sources to make creating an essentialist home easy. You'll also get tons of photo inspiration and ideas for organizing your home. I'll share links to helpful resources along the way. Plus you'll have direct access to me via the FB group and email for questions at any time. You don't have to do anything but follow instructions! "My home was so full of stuff I felt like I was suffocating. But I just couldn't get far decluttering on my own. I would get bogged down in one drawer and then end up giving up after hours with little progress. This program was a lifesaver. I just handed control over to Kelly and followed her instructions. I felt like I should have been able to do this myself, but OMG I'm so glad I didn't. I still would have been struggling today instead of having the freedom to spend my days outside with the kids instead of inside cleaning and being frustrated. I couldn't be happier with the time and money I spent on this." “It seemed like my life was going by in a blur without me living it. I was constantly stressed and tired, but organizing and decluttering my home was too overwhelming for me on my own. When I started doing the lessons, it felt like Kelly was with me the whole time urging me to take baby steps and keep making progress. The directions were very simple and I liked having everything laid out for me. I've decluttered so much 'non-essential' stuff from my home it's incredible! And the tweaks I made to simplify my house for my everyday routines have made such a difference. I now have a daily practice of living that's simple and joyful. It's fantastic!" Don't have time to simplify your home right now? Then can I suggest...this is when you need to simplify the most?The 'right time' to gain more control over your life and live like an essentialist is right now. Because as soon as you begin editing and simplifying your environment, you'll gain back time and energy for all the things in life you're so busy with. The overwhelm will stop. Plus, this program is spread out over a full year to give you lots of time throughout the months to complete the tasks and make significant headway without having to spend full weekends clearing out your garage. Don't want to spend the money when you can do it yourself? But HAVE you done it yourself? Sometimes you need help to get things like this done. There's no shame in it. You spend money on yoga and fitness classes with an instructor guiding you, right? This is no different. As a coach I'll guide you along at a comfortable pace that will deliver results. You'll gain significant mental and emotional health and wellness benefits from a clutter-free home, at a fraction the cost of a yearly gym membership. Don't be reluctant to get assistance when you know you'll get results so much more quickly and easily this way. At just a little over $16/month, this is an investment with a high rate of return. Afraid you'll purchase, then not complete the program? That's what I'm here for. My job is to keep you motivated and accountable. I'll help you work through any emotional or habitual roadblocks. This is not a course that you purchase and do on your own. This is a program where you allow me to come into your life through regular email check-ins, video chats, and if truth-be-told, a little nagging. I really want you to finish this program and have a home you love to be in. I want you to be less busy with 'keeping home' and have more time for an abundant life. Most of all, I want to see you transform your life as you transform your spaces. -You feel like you spend way more time cleaning and organizing your home than making memories in it. -Your home is cluttered and far from calm, but you just don't know where or how to begin simplifying it. -You have an organized-ish home but you'd like to be walked through a a step-by-step process of simplifying it further and tackling specific problem areas like your wardrobe, kitchen, closets, garage/basement and workspace. -You want to entertain but feel too embarrassed to have people in your home. -You have a nagging feeling there's more to life than cleaning and picking up. -You want to become an extreme minimalist. While I believe in the practice of owning less stuff to gain more freedom, I practice and teach Essentialism, which is a more moderate way of simplifying to have only those things around you to live comfortably, peacefully and abundantly. It's about creating an environment that helps you thrive. -You're not ready to put in about 5-10 hours over the course of a month to complete the action steps. Each month is different, and some months will be lighter for you than others, giving you to time to catch up if you get behind. The time you spend doing the lessons can be divided into 15-minute increments every day or a few hours each weekend - it's up to you. I'll give you prompts, homework and reminders, plus time in the Facebook Group to comment on your progress and help you with any roadblocks. But you'll need to do the work. Purchase the 12-month Essentialist Home Program for $127 dollars (CAD). That's just over $10/month for a full year of coaching and a home that's clutter-free, functional, calm and organized. Think of it as your self-care for the year. It’s less/day than your coffee or tea! Why does this program take a whole year? I know it seems like 12 months is a huge commitment, but in actuality I chose to spread out the work over a year so that you won’t be overwhelmed with too much at once and end up quitting half way through. I want you to actually get the long-lasting results from simplifying your home and habits, and that means changing your home home and your systems slowly but surely over time. It’s manageable by giving you specific tasks each month to complete, and continually building on the results you’ll get. This is an email and online program. When you sign up, you'll get immediate access to the all of the lessons online, plus a course checklist and other resources. You'll begin getting emails from me throughout each month from the date you begin the program. I'll outline the lessons weekly and monthly, and give you homework to do. I’ll check in regularly to push you to do the work. You'll also have a private Facebook group for questions, feedback and sharing your work with me and other course participants. Yes, once you've purchased the course you'll receive an email from me with your password and instructions to get started. You'll have immediate and lifetime access to the full course online and my coaching emails to you will begin. Your year will begin from the date of purchase. How long will the lessons take me each month? Everyone works at a different pace and has a different size house and clutter, so it's hard to say how long it might take you, but a good benchmark is to bank on 5-10 hours a month. You might want to tackle a few lessons at once over a weekend, or space it all out by doing 15 minute dashes each day. Some months will require more work than others depending on your home. Some months you'll have less to do and you can have a break from homework or spend that time catching up from last month if you were away or particularly busy. Do I have lifetime access to the lessons? Yes! The lessons are all online on the program website and you'll have the password to access these at any time, even beyond the one year. When you purchase the course you'll have lifetime access so you can go back to the lessons if you'd like to go through them again. You'll also have lifetime access to the private Facebook Group which is active with others going through the same process. Will I have access to you as a coach? You bet. I'm very active in the private Facebook group where I provide ongoing support. You'll also be able to email me at any time. If you need even more personalized help with a particular area of your home, you can also opt to purchase a one-hour 'Ask Me Anything' call with me so that I can see your home, provide ideas, and answer any questions you may have about its design and function. Are you the right coach for me? Have a look at my portfolio and profile page to get a feel for my design style, my background and what my clients are saying. And take a look at the latest blog posts. These will give you a good idea of what to expect in my course. My teaching style is relaxed, supportive and humorous, but I also always try and keep you moving so you reach your goal. There are many wonderful courses online to help you simplify and declutter your home, and each has it's unique approach. I've found, through working with past course students and clients in real-life, that a coaching program - not lessons on their own - are the best way to ensure success and help you maintain long-term success.